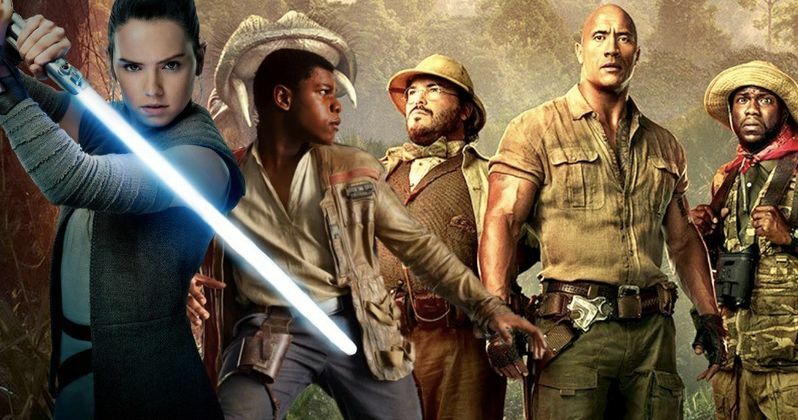 After the amazing success of Jumanji: Welcome to the Jungle, Sony Pictures is already planning Jumanji 3, while eyeing a possible December 2019 date that would put it up against the highly-anticipated Star Wars 9. Sony Pictures chairman Tom Rothman has yet to officially put Jumanji 3 on their release date calendar at this time, but the unconventional box office success of Jumanji: Welcome to the Jungle has the chairman eager for this sequel to come together, after succeeding in the monstrous shadow of Star Wars: The Last Jedi. Here's what Tom Rothman had to say about why he decided to open Jumanji: Welcome to the Jungle against Star Wars: The Last Jedi. "From early on looking at the footage, it was clear this was a Christmas movie families would want to see together. I thought we could spit in the giant's eye." Star Wars: The Last Jedi opened on December 15, and, as expected, it posted the biggest opening weekend of the year, pulling in $220 million, the second best all time behind Star Wars: The Force Awakens' $247.9 million. Jumanji: Welcome to the Jungle opened just five days later on December 20, along with Paramount's Downsizing, Universal's Pitch Perfect 3 and 20th Century Fox's The Greatest Showman, and while this new Jumanji adventure, starring Dwayne "The Rock" Johnson, opened in second place with a respectable $36.1 million, its performances in the following weeks were even more impressive. Producer Matt Tolmach revealed that the 22-year gap between the original Jumanji and this new adventure actually benefited the movie. "Jumanji is a brand that is remembered fondly but the fact that the last movie came out long ago gave us a freedom to make it feel fresh for a new generation." In its second weekend at the box office, Jumanji actually posted a 38.4% increase from the previous weekend, taking in just over $50 million, while still coming in second place to Star Wars: The Last Jedi, but in January, the movie has simply dominated at the box office, winning three weekends in a row by posting minimal decreases of just 25.6%, 24.5% and 30.6%, respectively. Earlier this week, Jumanji passed Skyfall to become Sony's biggest hit that isn't a Spider-Man movie, and it's possible it could pass some of those Spidey movies as well, at some point. Jumanji set an unconventional box office record by becoming the first movie ever to not open at the #1 spot at the box office, and still go on to make over $300 million domestically. The movie had been in on-and-off development for years until 2014, when writer Chris McKenna (Spider-Man: Homecoming, Ant-Man and the Wasp) came up with the idea to change it from a Jumanji board game to a Jumanji video game where a group of teenagers inhabit the video game avatars. Jumanji: Welcome to the Jungle currently sits at $319.4 million domestic and $771.2 million worldwide, from just a $90 million budget. This report from The Wall Street Journal doesn't reveal a specific release date, but Disney will roll out Star Wars 9 on December 20. If Sony sticks with the same formula, of releasing Jumanji in theaters five days after Star Wars, that could mean the studio is eyeing a Christmas Day release for Jumanji 3. Nothing is set in stone at this time, but given the immense success of Jumanji: Welcome to the Jungle, it wouldn't be surprising to see Sony give the official green light for Jumanji 3 sooner rather than later.